The future is bright. The future is electric (and petrol). The BMW i8 I12 is a bit of an oddball in the realm of the supercar. This is a genre that has traditionally been all about excess; from the Lamborghini Miura that pushed the term into common usage back in 1966 with its juicy V12 motor and spaceship styling, to the common crop of absurd hypercars. The Bugatti Chiron has 16 cylinders and 1,479bhp. The McLaren Senna has the sort of aerodynamic body addenda that could allow it to drive up walls. 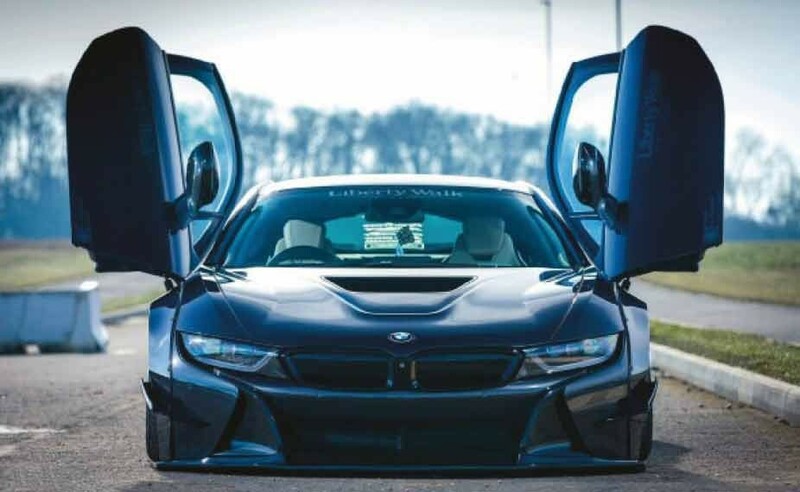 And the i8? It’s got the three-cylinder, 1.5-litre engine from a MINI. Not exactly out to set the world aflame, is it? Ah, but it is. The whole is far greater than the sum of its parts. You see, whereas the idea of a hybrid car started off with Toyota Prius owners knitting their own yogurt and acting all high-and-mighty about their mpg figures, sports car makers have been using hybrid drivetrains for performance rather than economy. You’ll have spotted this with the likes of the Porsche 918 and McLaren P1 – technology that’s bled down from Formula One, using electric motors to boost petrol engines for high-octane thrills. So the BMW i8 takes this to its logical conclusion: in isolation, the three-cylinder engine doesn’t sound that amazing, with its 228bhp. A decent figure for its size, but hardly supercar territory. The electric motor isn’t all that thrilling either, offering up 129bhp. 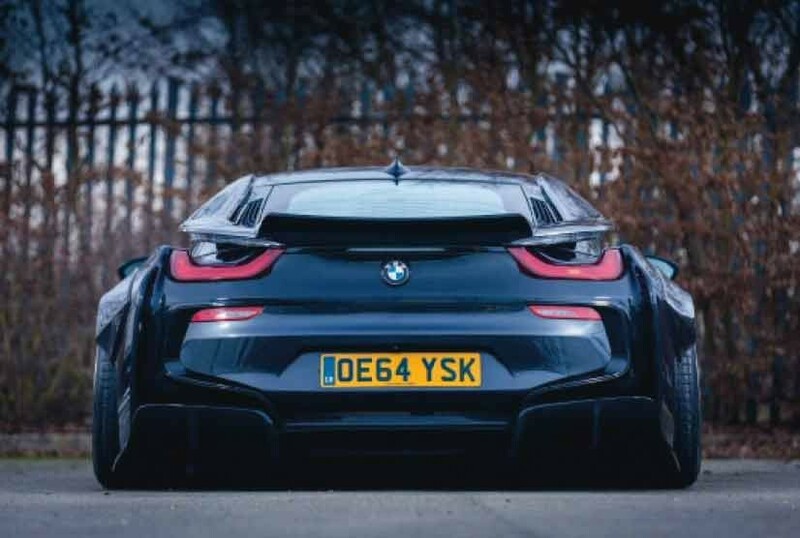 But add them together and you get 357bhp, along with the immediate torque that electric propulsion provides; with a kerb weight of 1,500kg-ish and a beautifully engineered chassis, the i8 – in factory-stock form – accelerates from 0-62mph in 4.4-seconds. That’s exactly the same figure as the Audi R8 4.2 Typ 42, the Panoz Esperante, the Jaguar XJR-15, the Lamborghini Diablo. See, its book-smarts have helped it grow the muscle to play with the big kids. The other really impressive thing is the way it looks. The i8 may have launched back in 2014, but it still seems like a prototype for a car pencilled in for 10 years in the future. Seeing these things mixing with the everyday traffic seems bizarre, they just look like nothing else out there. 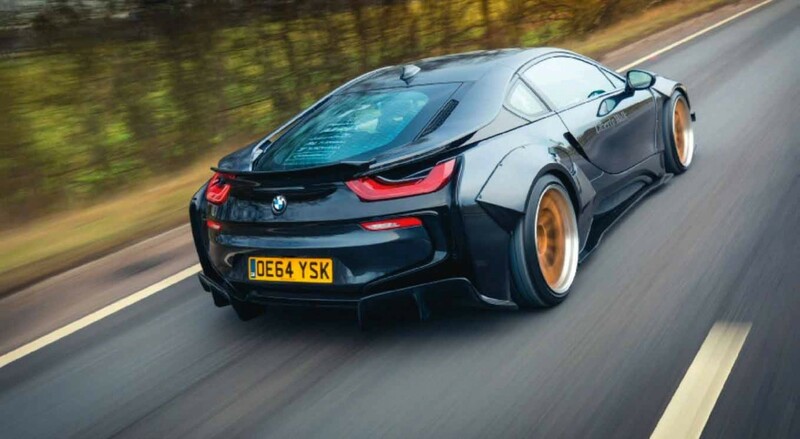 Now, most people would be satisfied to keep the i8 on the pedestal it deserves to call home, admire it for its quirks and just be satisfied that such a thing exists. Not Liberty Walk. These world-renowned Japanese modifying gods have a finger in every automotive pie. They’ve been moving into the supercar market and you can be damn sure that just because a car looks like a flying saucer, it’s by no means untouchable. The maestros of cartoon girth are all over the supercar scene, and the advent of Liberty Walk Europe means that us Brits are now able to commission genuine LB Works builds and not have to go through the hassle of having it shipped over in a container. The Performance Company, based in Wellingborough, are the official agents for Liberty Walk and they can take on any commission. So why an i8 this time? Well, why not? “As soon as we saw the first render of the i8 kit, we knew we wanted to build that car,” says James Pearman, Director of The Performance Company. 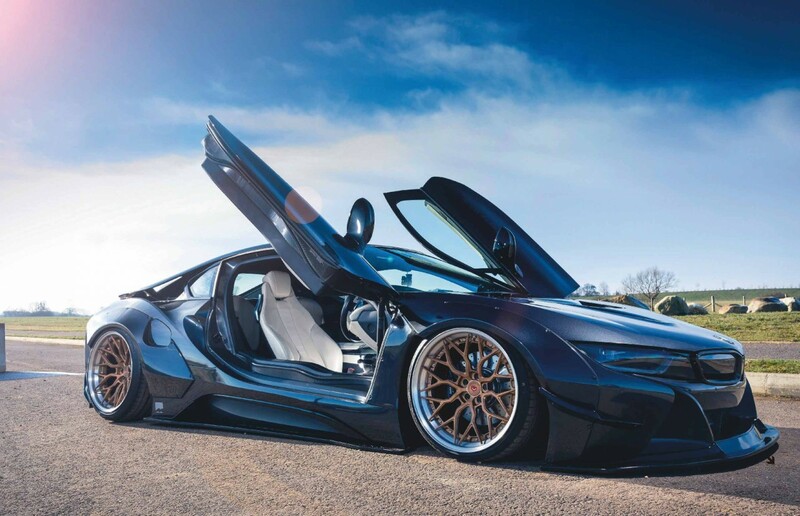 “It’s a further step up towards the supercar market, and it’s how the i8 really needed to look – so much more aggressive. Many of you will already be familiar with the work of Colourkraft. While the bread-and-butter of this stellar outfit is the traditional bodywork, paintwork and insurance repair jobs, founder David Loraine and his team have always striven for a level of absolute perfection and fastidiousness which has allowed them to branch out into custom work. If you’ve been to a car show in the UK recently you’ll almost certainly have seen something these guys have put together, like the bagged satin green Liberty Walk Lamborghini Aventador that featured in these very pages last year. It helps greatly that Colourkraft is an official approved supplier and installer of both AirREX air-ride and Liberty Walk body transformations, and as the preferred installer for LB Performance Europe, a lot of builds come directly from the top and they know this stuff inside-out. This i8’s factory colour was Sophisto Grey, a rich metallic graphite, so once the kit was fitted Colourkraft painted it to match, as well as taking all of the factory blue accents (because BMW love to slather their electric cars and hybrids in neon-blue trim to make them look like something out of Tron) and toning them down to a subtle gloss black. All of this has the pleasingly jarring effect of making the car look ostentatious but also quite subtle. A melon-twister of an aesthetic trick, but one it pulls off masterfully. “At first, we fitted Forgiato wheels, and then installed a full AirREX air-ride system,” says James. “In order to up the power a little, we added Pipercross induction and an FI exhaust, before getting it remapped by Motech Performance. It now runs a little over 400bhp. 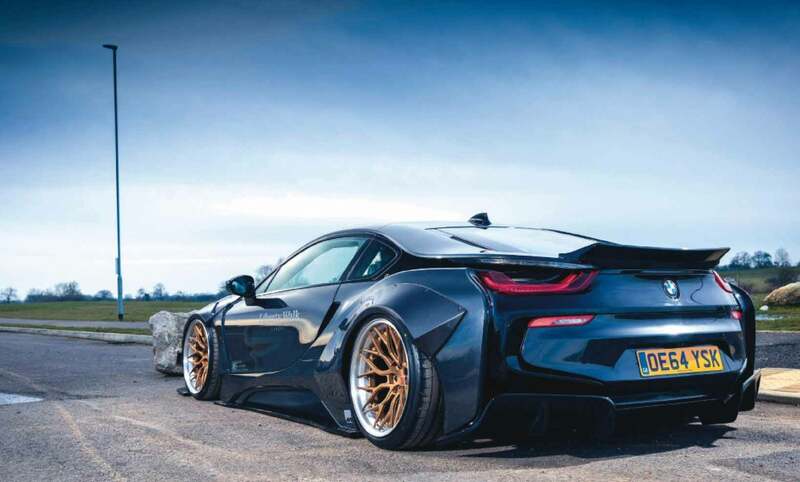 This is undeniably true, and with the beautifully executed modifications to this Sophisto Grey example, it’s amped up the supercar credentials of the i8 to a whole other realm: it already had the outrageous looks, but now it’s sufficiently crazy to ensure uniqueness in the supercar world – you’re not going to see another Liberty Walk i8 as you cruise past Harrods – plus it’s got that extra bite to give the performance a steelier edge. 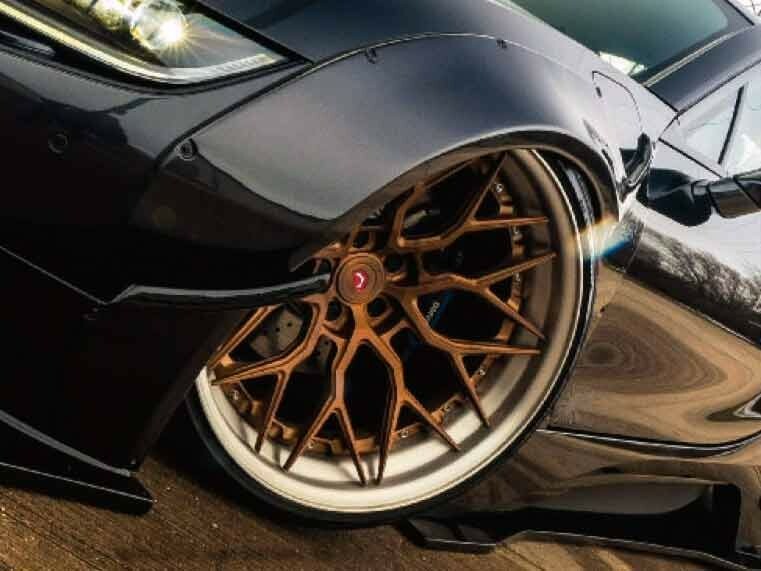 What The Performance Company have achieved here is to take an often-misunderstood supercar and shove its performance credentials right in everyone’s faces, using the expertise of Liberty Walk and Colourkraft to turn it into something truly world-class. The car’s for sale too. Although the team are determined to keep having their fun with it until a buyer comes along; there are plenty of shows across the UK and Europe which would welcome this unique creation with open arms. As long as James is holding the keys, the LB i8 will be getting out and about as much as possible. This oddball of a car has certainly found its niche. STYLING Liberty Walk widebody kit; Sophisto Grey; factory blue accents changed to gloss black. TUNING B38 1.5-litre three-cylinder turbo plus hybrid synchronous motor; FI Exhaust system; Pipercross induction; remapped by Motech Performance; 400bhp+. CHASSIS 20in Vossen S17-01 forged 3-piece wheels; AirREX air-ride setup. Somehow simultaneously both ostentatious and subtle. Open sesame! Interior has remained stock. Pipercross induction and an FI exhaust help it run a little over 400bhp. Vossen S17-01 forged three-piece rims. Any future plans for the car? Until it sells, we’ll be taking it to as many shows as possible across the UK and Europe! OK, let us know your deets so potential buyers can contact you: Sure thing. They can get us on mail@theperformance. co or 01933 685840. 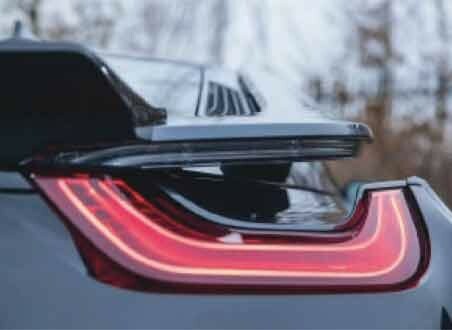 This i8’s FI Exhaust system is particularly cool. 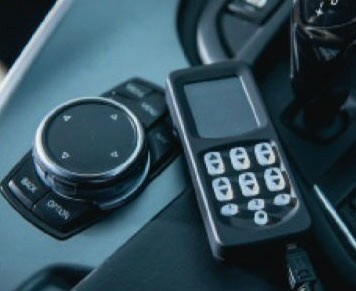 FI stands for Frequency Intelligent and these systems come complete with their own proprietary Valvetronic technology and a built-in intelligent controller; not only do they add power and make an incredible noise, but the remote control allows you to operate the internal valves and switch from Sport to Silent. How cool is that? You can even use a smartphone app to set which levels of rpm, mph or boost you want the valves to open at. So they’re not only magnificently engineered and constructed, they’re as cunning as a fox with a law degree, too.